The Burlington County Prison in Mount Holly, New Jersey is a hot spot for paranormal activity. Claimed to be a haunted prison, tourists, professional ghost hunters, and even those who simply have an interest in supernatural stories flock to this structure each year to indulge in their natural curiosity. This prison was officially opened in 1811, after being carefully designed by the American architect, Robert Mills. It was designed to include two stories, and a basement that could handle approximately forty inmates. A house designed for the warden of the prison was set to the side of this prison and connected to it using a tunnel. The year of 1965 ended the duration of this prison, as it housed more than twice the amount of individuals it was created for. However, not everyone left…maybe in body, but not in spirit…. In the year of 1999, renovations started to occur on this haunted prison. Rumors had circulated prior to the renovations starting that the structure was haunted. However, while these stories intrigued many, they were merely passed off. It was at the time when the changes to the structure occurred that many were convinced that this prison was, in fact, haunted. The renovations were a necessary part of getting the building ready to open as a museum, but many were not too happy to be working on the building once the ghosts made their presence known. As a matter of fact, many of the employees who conducted work during this time at this haunted prison left the job site and never returned. In an effort to reduce the fear and widespread panic that was occurring with the employees during renovations, the owners called in some experts to conduct a paranormal investigation. 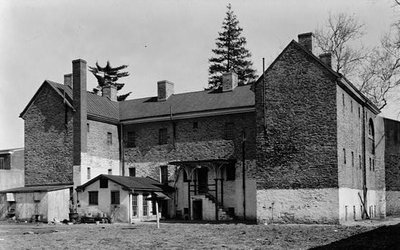 This team of professionals thoroughly investigated the haunted prison of Burlington with ghost hunting equipment that provided some pretty unique results. As a result of the photographs taken, the video that was recorded, and the basic EVP results, it was concluded that this was a haunted place that contained a number of ghosts and other types of hauntings. 1. When renovations were occurring, there were a number of strange experiences in which the workers experienced. An example of the complications that occurred included tools that would appear to be missing, and then turn up at odd locations in the prison. 2. Strange noises that could not be accounted for in the building were experienced. This included sounds like loud bang, what appeared to be people talking, and even screaming! 3. A ghost has been seen in the area where inmates took their showers when the Burlington Prison was open and operating. 4. A ghost, believed to be Joel Clough, who was hung in the haunted prison seems to remain in the cell that was designated for those who required maximum security, many have claimed that they have seen his spirit, while others claim to hear noises that sound like a mix of pure sadness and chains. 5. Voices that seem to be angry have been recorded on EVP equipment. If you are interested in researching this haunted prison for yourself, you may visit during open business hours. Monday through Saturday that is 10am to 4pm. If you want to visit on Sunday, it is open from 12pm to 4pm. Children under five years of age, individuals that are considered to be students, and seniors can get in the prison for free. Children over five years old must pay $2.00. Adults are required to pay $4.00. The prison is set up for those who are handicap. If you would like more information, call 609-265-5476 or 609-518-7667. Experience the haunted Burlington Prison for yourself!